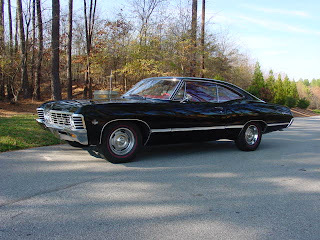 The Metallicar always cracks me up, because my very first car (hand me down from Mom) was a 1969 Impala. Clunky, big, but damn it, it was MINE. Actually, air conditioning was an option in '67. 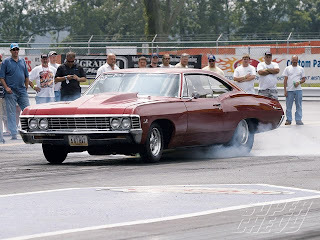 :-) I have a '67 4dr Impala. It drives like a typical American car of the era. Great for cruising but floaty around corners. Think of driving around in a sofa, hehehe. I LOVE her. She's my daily driver and gets about 18 mpg--so not so bad compared to SUVs and the like. Mine has power steering, cruise control, AC, an AM radio (yeah, sad!). These things are all original to the car. Jared and Jensen autographed her for me last summer. My interior is almost finished, next is paint and some new wheels. That is so SWEET! I'm so jealous! AuthorM, you'll need to get yours in shape by July and try to get it autographed (assuming we have any chance of getting either guy at the con...). AuthorM, I really really really want one--occasionally I shop for one, but like I said, the ones in any kind of shape are more than my 2005 car! Maria, cool! My friend Cindi's family had one as the family car, so she doesn't think it's as neat as I do. InTheEvening, WOW! She's GORGEOUS! Did you do any restoration on her? I've always loved classic vehicles, and wish I had the talent/patience to restore one. I've redone the interior. The original wasn't horrible, just very old and--gag--turquoise. I went all tan (didn't want to do a copy of the Show car). I'll paint her eventually. I plan on black, super deep with lots of clear coat. Black is a bit cliche, but for a 4 door, you need a really strong paint statement. Other than that, she's in amazing shape and a blast to drive. She has her original 327 V8. And being signed--yeah, that was too much fun to have done. The guys were sooo excited about it. Here's a before and after photo on the interior (prior to new door panels and black seat belts). Thanks for all the nice comments! :-) She's one of a few classics parked in our driveway, but she's my favorite, for sure. i have this car and it drives waaaaay better than a shopping cart. But mine rocks a large and in charge 454 engine and is well taken care of..
auto windows and locks costs like 100 bucks to do and its easy.